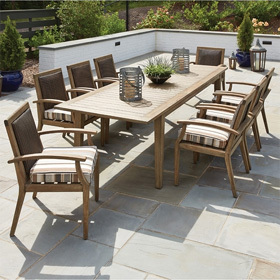 We offer a large collection of patio dining sets in modern to traditional styles from some of the best brands in the industry. These dining sets are engineered to withstand the outdoors and are made from durable materials like aluminum, wrought iron, wicker, and teak. All of the dining chairs and tables can be custom ordered with any of the manufacturers current selection of options and include free nationwide shipping.